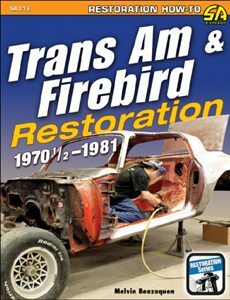 With the right equipment, you can certainly rebuild your Firebird’s transmission in your garage. But a professional-caliber rebuild requires specialized tools. You need an arbor press, and you must follow a detailed and comprehensive process. It may be evident that your automatic or a manual transmission needs rebuilding because common transmission problems are typically easy to spot. They exhibit any number of problems, such as sloppy shifting, slow engagement into gear, leaking from various orifices, and hanging up in gear. Rebuilding the transmission, along with replacing the torque converter, is the only choice to remedy these ailments. Manual transmissions require specialized tools and knowledge. The Muncie M-20, -21, and -22 were available in the Firebird lineup, but the M-22 is very rare option. Pontiac designated the M-21 on the build sheet, but in many cases, it was actually the BorgWarner Super T-10, which was phased in sometime in the mid-1970s. Manual transmissions usually require rebuilding after exceptionally high miles and extreme use, such as racing. When rebuilding these transmissions, you find that seals, bearings, and synchronizers have usually reached the end of their service life. Gears rarely fail unless abused, but they do need to be inspected for chipping, excessive wear, and any other potential issues. 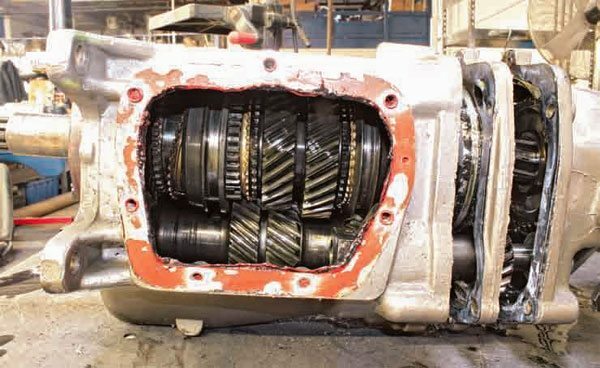 If your transmission is popping out of gear, grinding into gear, or has significant whining, it may be time for a rebuild. The M-22 transmission had special gears that used a helical cut for strength, but resulted in increased gear noise. The Muncie M-21 was installed in the 1973 Trans Am. To identify the transmission, refer to the seven-digit serial number that is found on the passenger’s side of the case. The serial number codes are provided online. Keep in mind that the casting numbers are Muncie part numbers, not GM part numbers. You find the date code on the side cover. A month designation of 1-12 is shown in one of the two half-inch circles while another circle has the day of manufacture. This is a Turbo 400 automatic transmission. Notice the rectangular plate located on the side just behind the chain. This plate has the transmission stamping on it to identify the application. Removing the side cover of the transmission lets you view the condition of the gears. When inspecting the gears, look for any chipped or worn teeth. Generally, the worn teeth have very sharp edges. You also want to look for any color changes in the metal. Blue in the gears is a sign of the transmission having been overheated. Overheating generally results from leaks rendering the transmission low on fluid. Overheating also can indicate hard usage from abuse. If you see any blue, I recommend a complete rebuild and replacement of the affected parts. So, if any part of the transmission needs repair or replacement, it is a good idea to rebuild the transmission while it is apart. It makes sense, as the labor is essentially the same whether or not you are rebuilding the transmission. 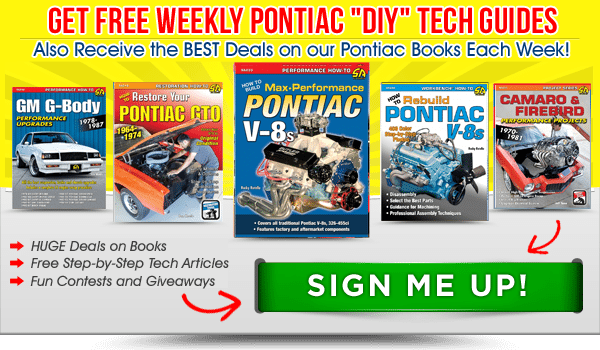 If you endeavor to rebuild the transmission yourself, Paul Cangialosi goes into the entire process step-by-step in his book Muncie 4-Speed Transmissions: How to Rebuild and Modify. The removal of either transmission is not difficult. It is best to have a lift available and use a transmission jack. Whether you are removing a manual or automatic transmission, they are both fairly heavy. I do not recommended removal to be performed with just muscle: use mechanical support. 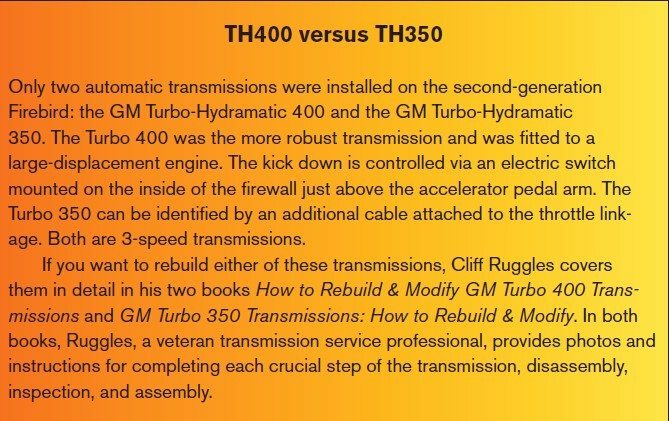 The process for removing a Turbo-Hydramatic 350, TurboHydramatic 400, or Muncie 4-speed is similar. It is not all that difficult but is labor intensive. As with other restoration processes, you need to pay attention to how you remove the bolts, take notes, and take plenty of pictures to document the removal process. You will need these tools: a pry bar, 1/4- and 3/8-inch drive ratchet sets, open-end wrenches, and pliers. Following is a general overview of the removal process. Use a socket and ratchet to remove the retaining nuts and straps on the driveshaft, and then you can remove it. A pry bar may be necessary to push the U-joint assembly out of the rear axle yoke. Slide the shaft out until the front yoke clears the output shaft. Remove the transmission mount bolts with a socket and ratchet. 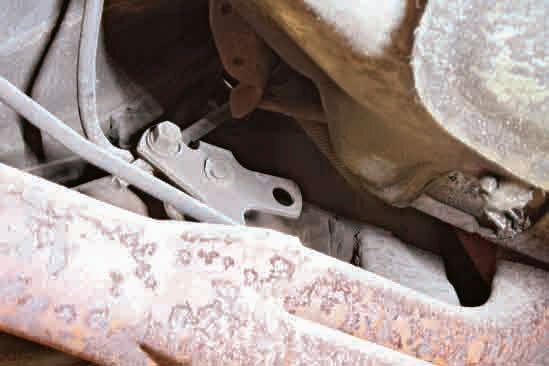 Use an open-end wrench to disconnect theclutch pedal linkage at the clutch fork on the threaded part of the linkage. Remove the shifter handle in the passenger compartment using a socket and ratchet. You need to push the shifter rubber boot down to access the bolts. The 4-speed transmission has been installed. 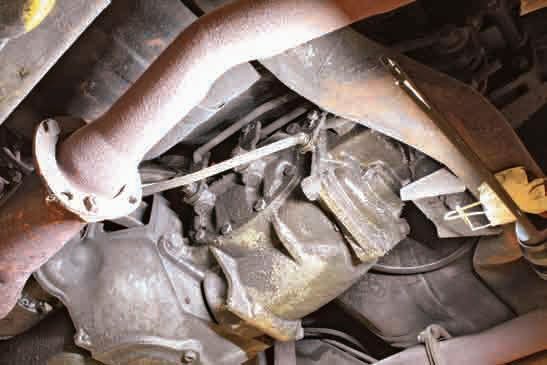 To remove the transmission from the vehicle, use a wrench to loosen the nut that retains the reverse lock-out rod. It’s located at the base of the steering column. Remove the bolts that connect the transmission to the crossmember. The VIN on a BorgWarner Super T-10 is stamped in the side of the case. This particular Super T-10 was installed in a 1979 Macho Trans Am. Use a socket and ratchet to disconnect the Z-bar clutch mechanism. Remove the four bolts that hold the bellhousing to the transmission. Two are on each side on the housing ears. Use a socket and ratchet to remove the bolts that hold the bellhousing to the transmission. 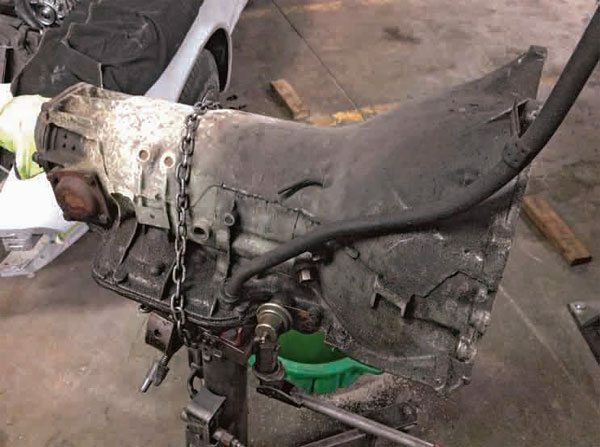 Make sure the transmission is properly supported. Place the transmission jack under the transmission and lift it slightly. Remove the transmission crossmember bolts that hold it to the frame and remove the crossmember. Slide the transmission back enough to clear the bellhousing and lower the transmission. 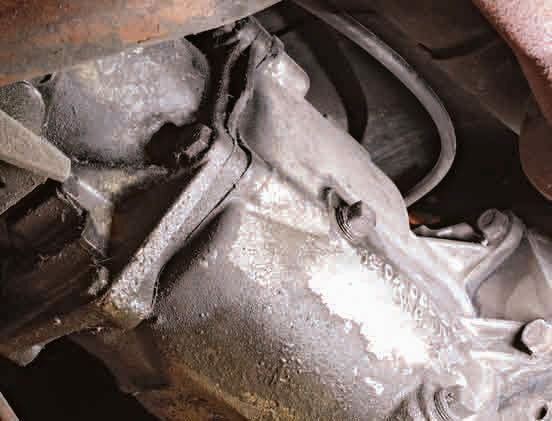 Once the transmission has been removed, remove the bellhousing bolts that attach the transmission to the engine. You need a ratchet and socket along with an extension and possibly a swivel to fully access the bolts. After those bolts have been removed, pull the bellhousing away from the engine. The clutch assembly can then be removed with a socket and ratchet. Once the clutch assembly is removed, you have access to the flywheel bolts. Those bolts thread into the back of the engine crankshaft. Remove them with a socket and ratchet. The throwout bearing also needs to slide off the clutch fork. Remove and replace the pilot bearing at this point. Use a flat-blade screwdriver to remove the bearing. You need a clutch alignment tool to center the clutch properly to the flywheel. Most good-quality clutch kits come with this tool. The flywheel is attached to the engine. I recommend having the flywheel turned at a machine shop to provide a clean, flat surface for the new clutch to operate against. A flywheel is similar to a disc brake rotor. If the brake rotor is contaminated or warped, the brake pads do not operate smoothly or efficiently. The same theory applies to the clutch disc and the flywheel. You should consider installing a billet flywheel because it weighs much less than the factory flywheel. The lighter flywheel enables the engine to turn faster as it has less weight on it. Make sure you count the ring gear teeth so you have the same number of teeth as on the flywheel you are replacing. Once the flywheel is installed, install the clutch assembly. Use the enclosed clutch pilot tool to have everything line up properly. Once everything is in line, you can tighten the clutch assembly on the flywheel. It is important to align the clutch because it allows the transmission input shaft to slide in. After the clutch is properly installed, place the throwout bearing and clutch fork into the bellhousing’s side opening. Now you can install the bellhousing to the engine block using the removed bolts. 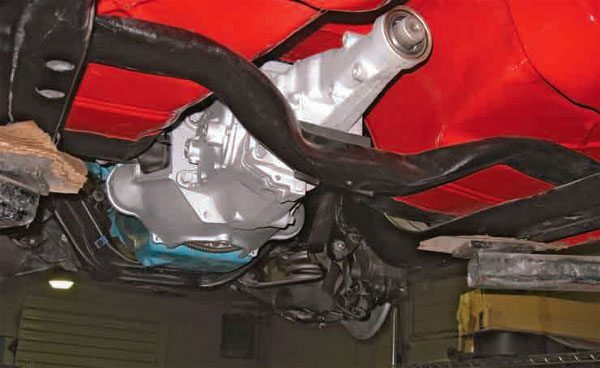 After the bellhousing has been installed, the transmission can be “stabbed,” or installed. The transmission should fit flush against the bellhousing. If it does not go in fairly easy, recheck all your prior work. Do not try to force the transmission in by tightening the bolts against the bellhousing. The transmission ears may crack or, worse, break off. 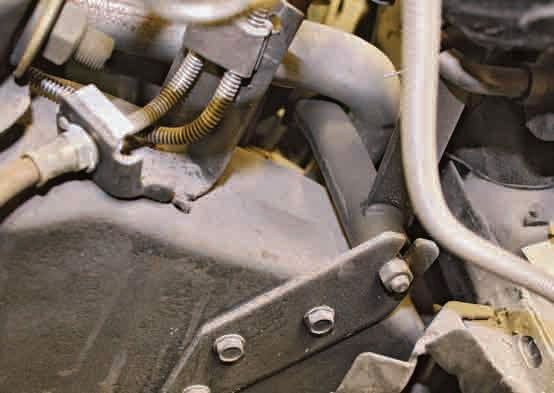 Once the transmission is installed, reconnect the clutch linkage using an open-end wrench. Install the transmission mount to the crossmember using a socket and ratchet. Install the transmission crossmember to subframe bolts using a socket and ratchet on one side and an open-ended wrench. Go back into the passenger compartment and connect the shifter handle using a socket and ratchet. Make sure you pull the rubber shifter boot back up over the bolts. Install the driveshaft by sliding the yoke onto the transmission output shaft. Place the opposite end into the rear axle yoke and install the retainer straps and bolts using a 1/4-inch ratchet and socket. Rebuilding an automatic transmission requires a lot of skill and expensive specialized tools. The cost for an overhaul on a Turbo 350 or 400 with a new torque converter usually costs about $1,200. Given the complexity of removing and installing the transmission, it is a wise decision to have the transmission rebuilt by a professional. A reputable shop usually gives a warranty. Following is a general procedure overview of the removal process. First, remove the driveshaft. Then remove the rear U-joint retaining bolts and straps using a socket and ratchet. It may be necessary to use a pry bar to push the U-joint out of the rear axle yoke. Lower the rear of the driveshaft and pull the shaft back until the yoke clears the transmission output shaft. Use a socket and ratchet to remove the transmission mount bolts. Disconnect the shifter. The shifter cable is connected at the shifter arm, which is located on the driver’s side of the transmission. Disconnect the reverse lockout rod also attached to the shifter lever by removing the arm retainer nut using an open-ended wrench. Slide the arm away. If you have a Turbo 350, the kick-down cable needs to be removed at the throttle linkage. Simply compressing the spring clip at the mounting bracket and removing the cotter pin at the throttle arm releases the cable. 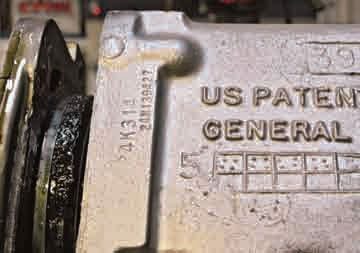 Remove the transmission inspection plate located on the bottom of the transmission case and around the starter. Remove the torque converter bolts. You need to rotate the flywheel manually with a large pry bar to gain access to all the torque converter bolts. Remove the bellhousing bolts that attach the transmission to the engine. 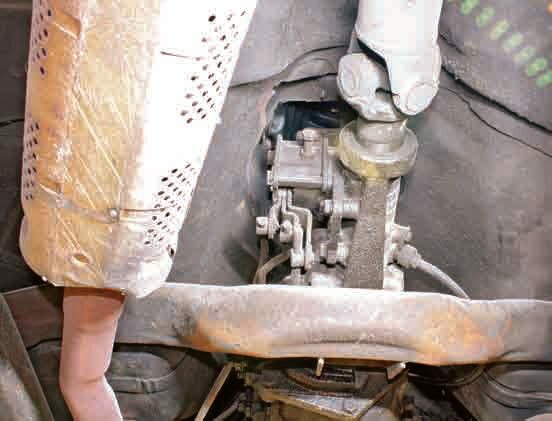 Place the transmission jack under the transmission and lift the transmission slightly. Remove the transmission crossmember outer bolts at the frame rails and slide the crossmember out of the way. Move the transmission back enough to disengage the input shaft of the transmission and to clear the flex plate. Installation is pretty straightforward. If you take notes and take good pictures of the removal process, you will be able to re-install the transmission without much trouble. You need to be aware of some specific techniques. On the Turbo 350 you want to make sure the kick-downcable is attached inside the transmission valve body area. The other end of the cable needs to be threaded behind the engine to the top of the intake manifold, so it is not in the way during the installation. Make sure the cooling line nuts are clean and the threads are in good condition. The transmission dipstick tube also should be installed prior to re-installation. Once the transmission is flush against the engine block, slide the transmission crossmember under it to hold it in place. Install the transmission bellhousing bolts to the engine using a socket and wrench. It may be necessary to use an extension and a swivel to obtain the proper seat on the bolt head. After the bellhousing bolts are about three quarters of the way in, install the torque converter bolts to the flex plate. You can turn the flex plate with a pry bar or a large flat-blade screwdriver. Tighten the bellhousing bolts after the torque converter bolts are tightened. The transmission cooling lines should be installed at both ends using line wrenches. Re-install the transmission mount to the transmission crossmember using a socket and ratchet. Attach the shifter cable and lockout rod. Install all electric connectors. Re-install the driveshaft.